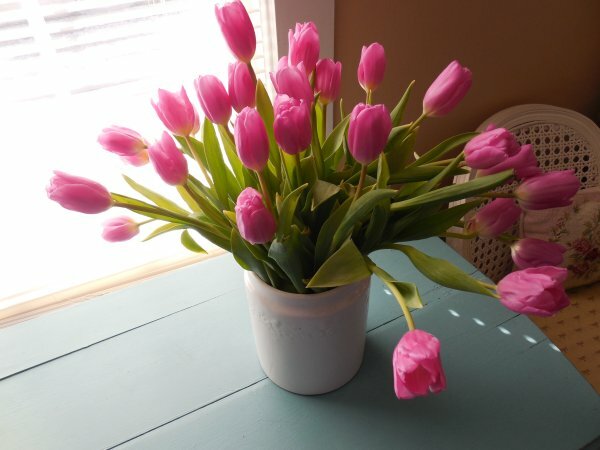 I went to Trader Joe’s recently specifically looking for bunches of tulips – and boy did I find them! I had to restrain myself… so many pretty colors! I bought three bunches of pink, and ended up with so many of them that the only vessel they would fit into was my cookie jar! 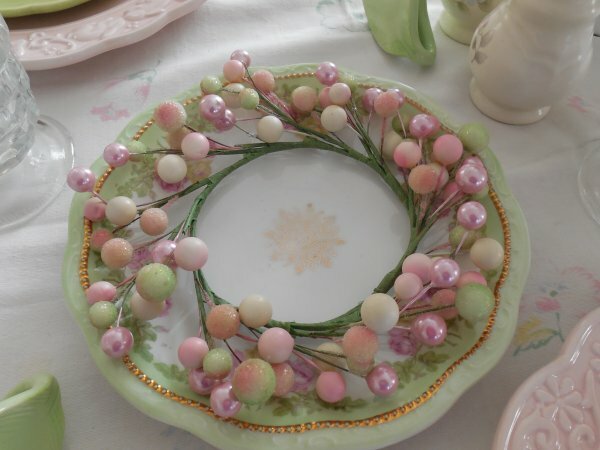 I also bought some Stock and another “filler” and cut those down to fit in my white ironstone soup tureen. 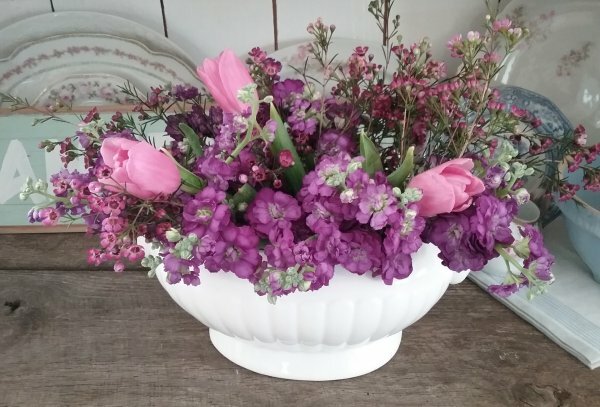 I can’t help it if I was in the mood for large containers full of Spring flowers! 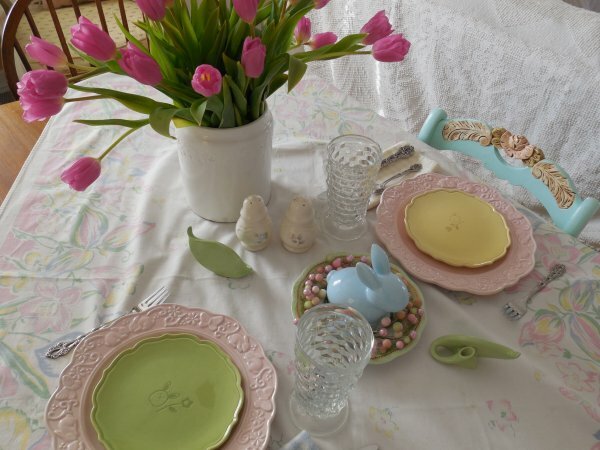 All of this loveliness seemed to call for a tablescape as well, so I pulled some Spring pastels from the cupboard and set a pretty table for two, with my tulips as the show-stoppers! 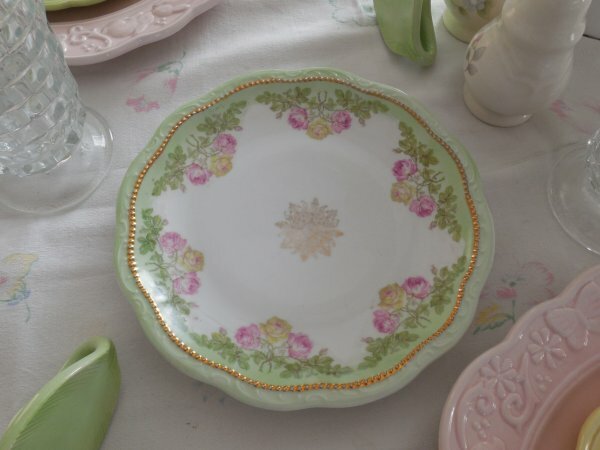 Back in my earliest days of collecting dishes (we’re talking early 1990’s… long before I knew anything about Haviland, or Limoges, or English transferware), my favorite style to mix and match was what I call “chunky pottery” – lots of solid colors and sculpted patterns, more ironstone than bone china. 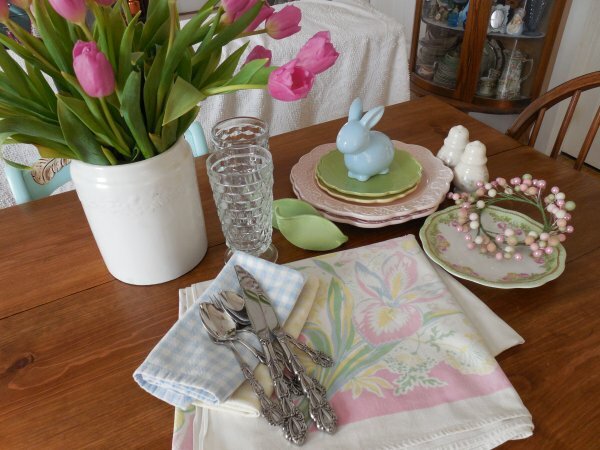 This table is kind of a revisit to that time period, and along with the tulips was inspired by these sweet little thrift-store finds… which were quite simply too cute to pass up! 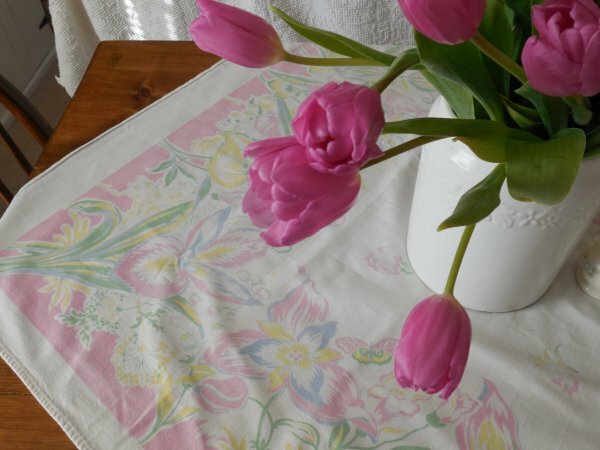 The table starts with one of my other long-time passions – vintage tablecloths from the 30’s, 40’s and 50’s. 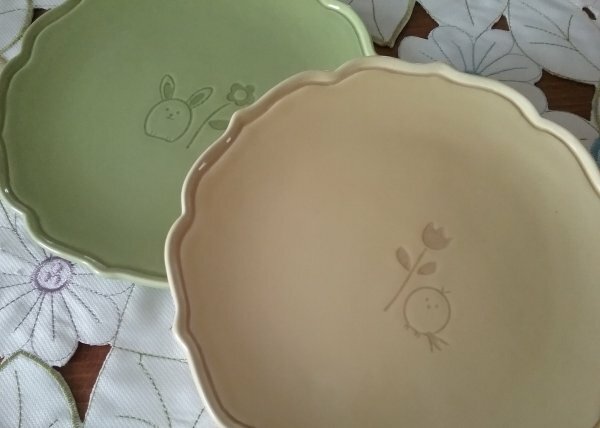 I just love the designs on these, and this one had the perfect pastel shades for my Spring table! It’s placed at an angle because it’s too small to cover my 3×5 foot table! 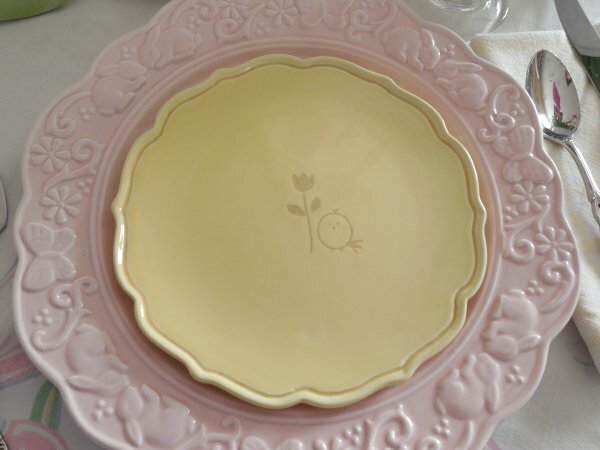 The place settings are very simple – a pink “chunky pottery”-style dinner plate with sculpted bunny-and-butterfly-themed pattern, which, unbelievably to me, are not marked with a brand name. 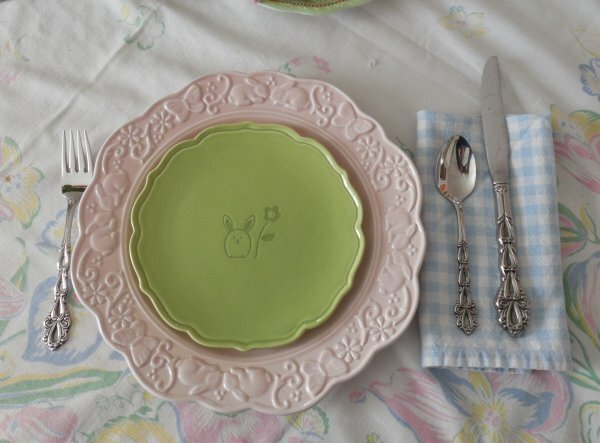 Each one is topped with one of the cute Spring-themed dessert plates, which are by Tag. 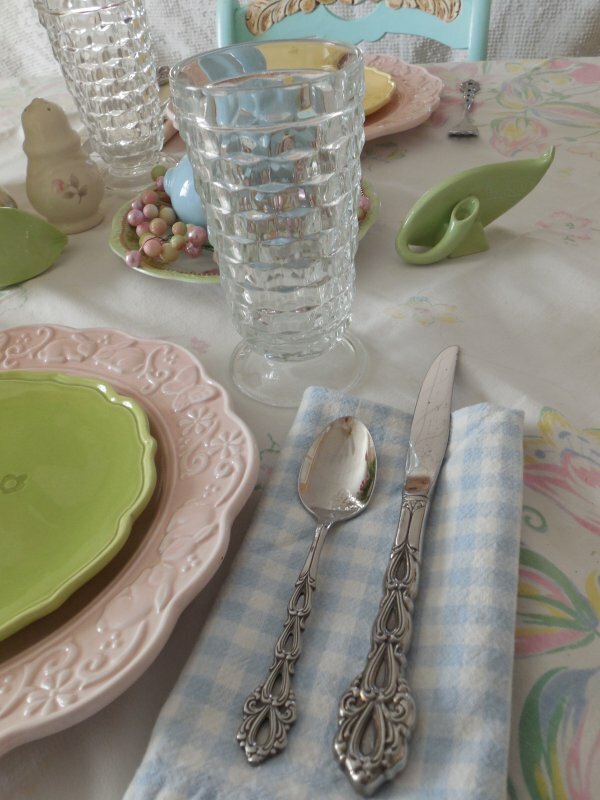 Blue and yellow checked napkins carry through the casual feel of the table. 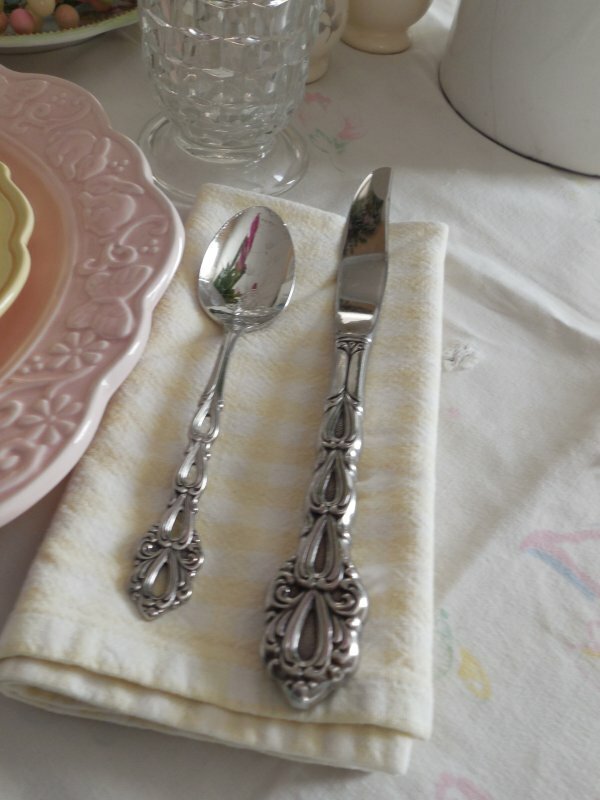 And the flatware is my vintage “Chandelier” by Oneida. 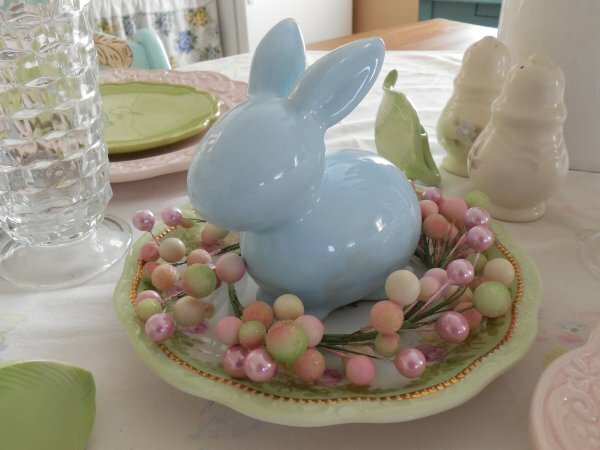 The tulips really took center-stage, but I did also create a small centerpiece using this sweet blue rabbit, nesting in a pretty bone china plate surrounded by a little beaded candle ring. 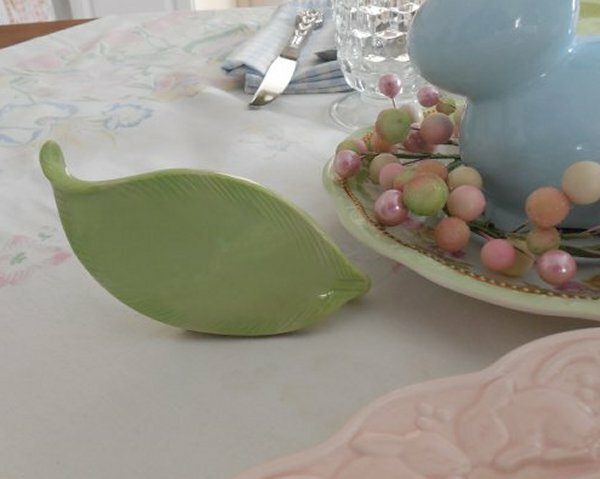 Also on the table are these sweet ceramic leaves – I think these are possibly for writing seat assignments, but I don’t know what you’d write with that could be easily removed later. 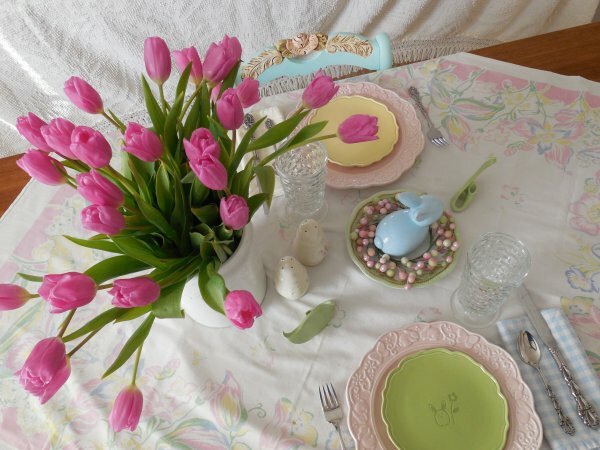 So for me they are just decorative and speak to the Spring theme! 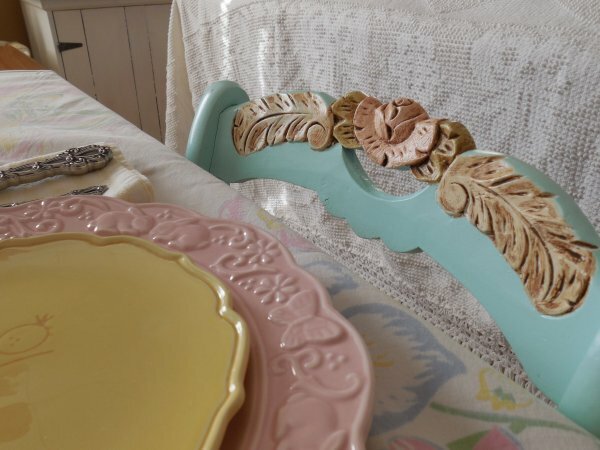 I loved how all these elements looked so sweet with my “storybook chairs” that I painted last year. And an image for you to Pin if you’d like, for future ideas! 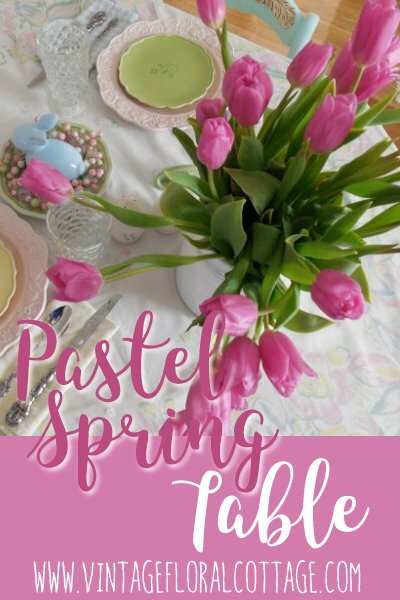 I hope “Spring has sprung” for you, too! 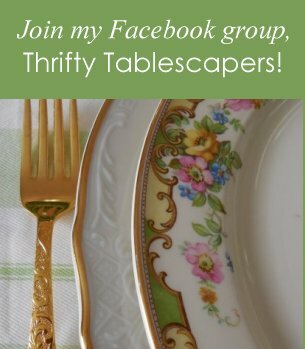 I’m sharing for Tablescape Thursday over at Between Naps on the Porch! 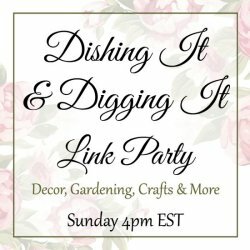 Please share on your favorite sites! 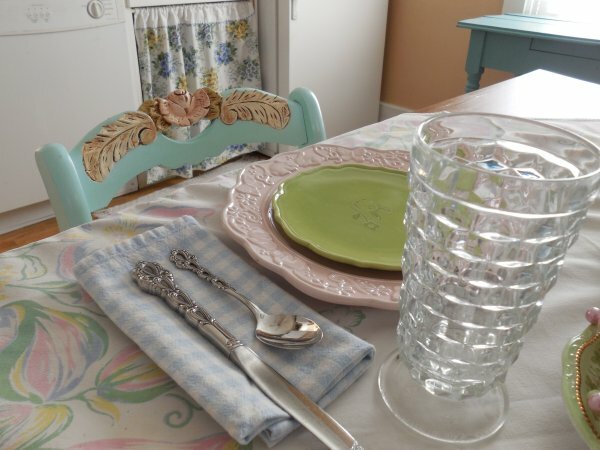 This entry was posted in Dishes, Tablescapes. Bookmark the permalink. The closest Trader Joe for me is like an hour away, I need to visit. 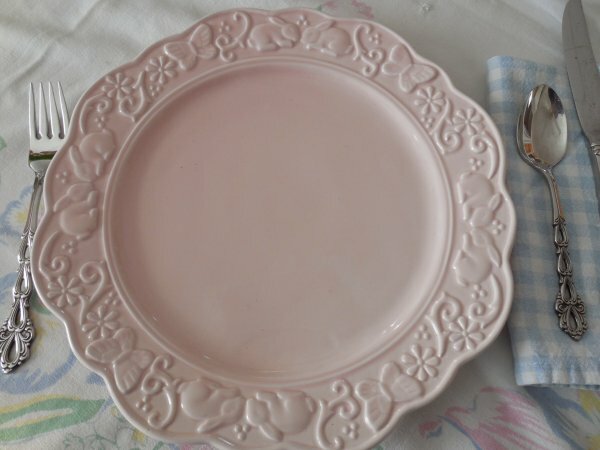 Lovely plates and table setting. Thank you! 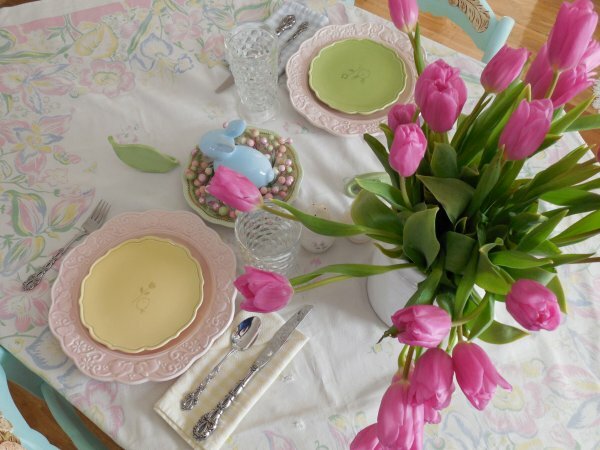 I admit, I completely took Trader Joe’s for granted… they were here for two years (or maybe more) before I ever stopped in… am so glad I did and discovered their beautiful flower market! So beautiful and soft. Even the elements gathered together look warm and inviting. Thank you, Ola! 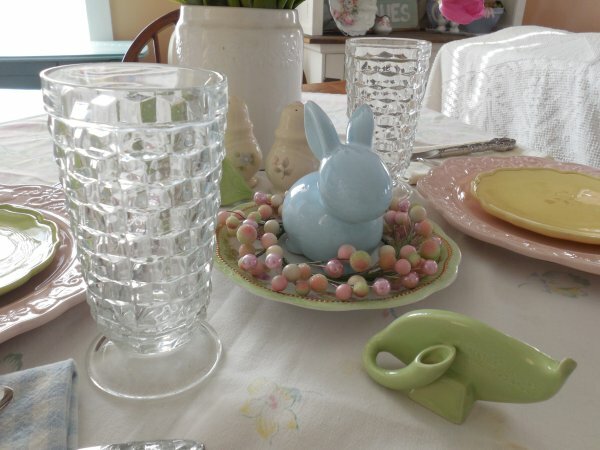 I like doing the “put-away shot” almost as much as I like doing the actual tablescape! These colors are beautiful! 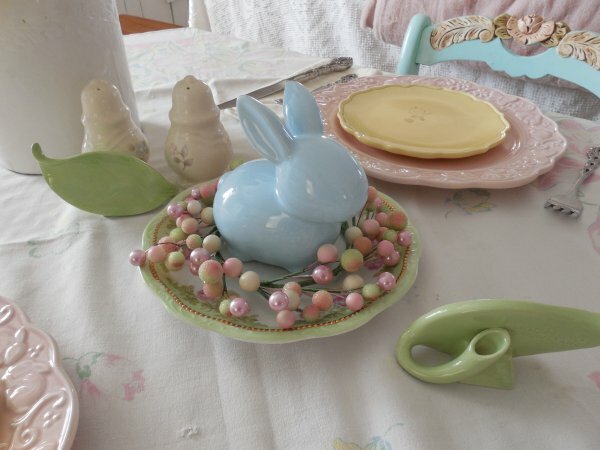 Love all your pieces! Thank You! 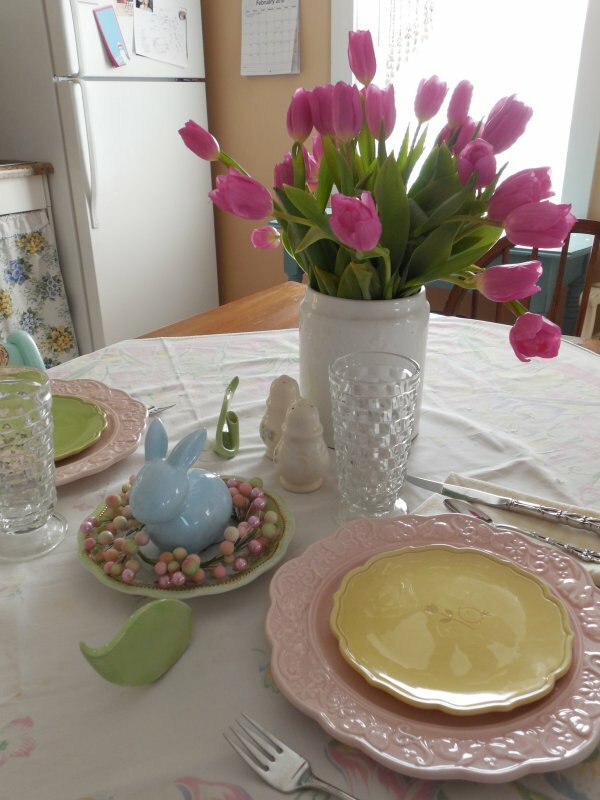 Those tulips sure made the house look like Spring! 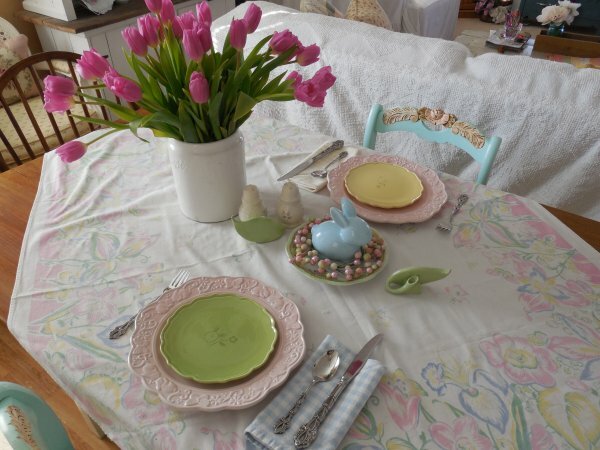 Beautiful table, lots of Spring color! 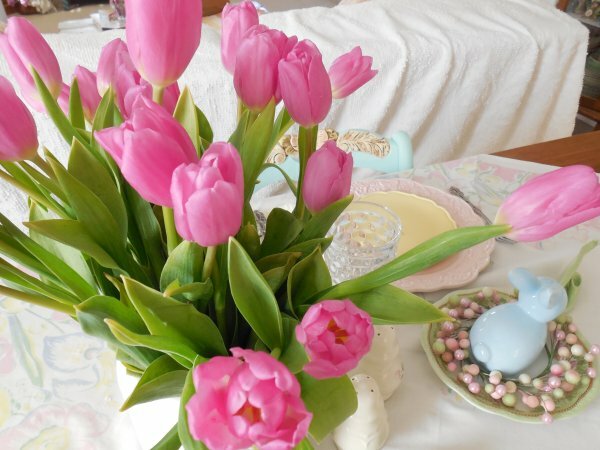 Counting down till Spring, your tulips are beautiful! Thank you so much! Counting down here too! 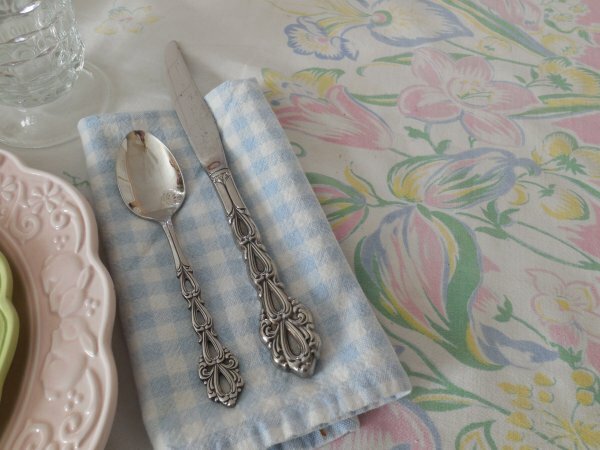 Love to set pretty tables on a budget? 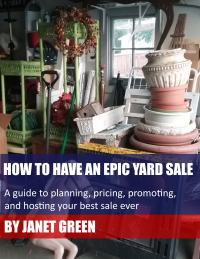 My e-book: How to Have An Epic Yard Sale! 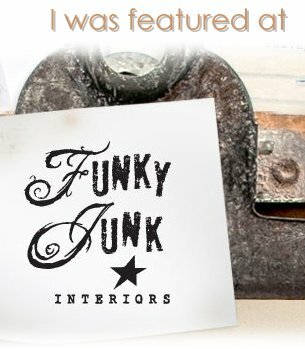 Click the book cover image to purchase for just $2.99!